If You live in the Myrtle Beach area most likely you own a heat pump! A heat pump warms in the winter season and cools in the summer. Or at least that's how it's supposed to work. A heat pump cools a house by moving indoor heat to the outside; it warms the house by moving exterior heat to the inside. A heat pump is a heat exchanger that removes heat from indoor air to cool it and removes heat from outside air and pumps it indoors to heat up a house. It takes advantage of liquid’s tendency to soak up heat as it expands. A heat pump has an outdoor unit in which a fan moves air with a coil that soaks up heat. Refrigerant journeys back to the outdoor device to start another full cycle with the pump. 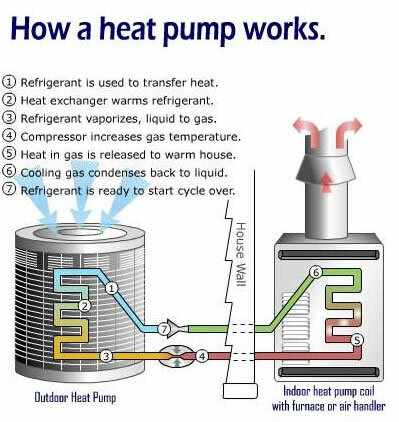 A heat pump has an outdoor device in which a fan moves air through a coil that absorbs heat. A blower presses return air with the coil, warming the air and move it into the ducts. Refrigerant moves back to the outdoor unit to start another full cycle with the pump. An automatic reversing valve reverses these flows as required to keep the home's indoor comfy.